"Hundreds Homeless at Colfax - Driven to the Hillsides by Raging Floods - Houses Swept Away by the Rushing Waters"
The front-page headline of the March 3, 1910 edition of the Spokane Daily Chronicle described nearly 500 residents of Colfax as they were left without shelter as the Palouse River flooded homes, businesses and railroad depots. 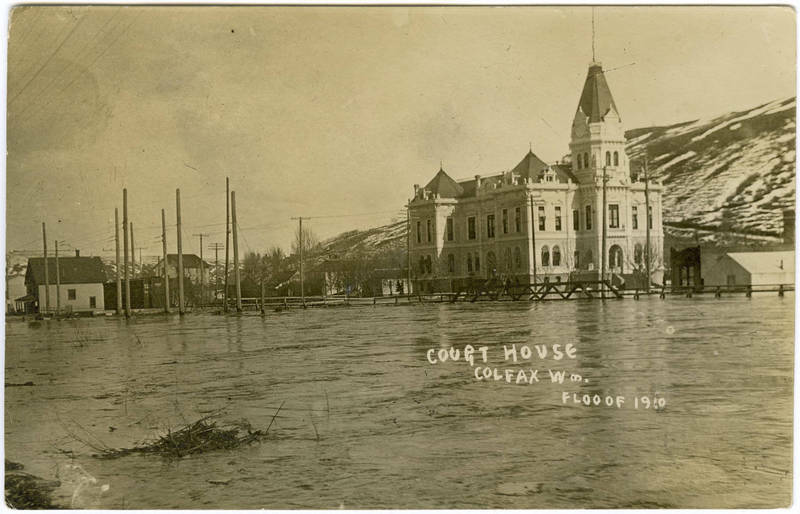 Although it suffered the worst devastation, Colfax was, by no means, the only town affected by the raging waters of the relatively small, yet powerful and dangerous river. Every community in the region near the Palouse River and even its tributaries, such as Pine Creek and Latah Creek, were subsequently inundated as well. 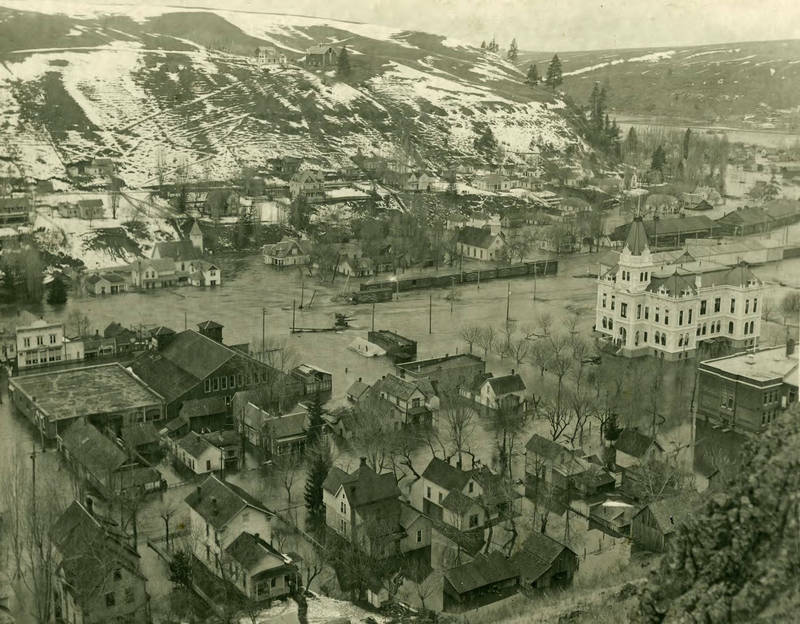 Residents of the Palouse region who lived near the rivers and creeks had learned to live with floods occurring every ten years or so, but never had they witnessed anything like the 1910 floods. As settlers transformed the grasslands and forests of the Palouse to support industrialized agriculture and logging, they unleashed forces that would wreak havoc on their frontier communities. washed-out and Colfax and Rosalia (among others) were under an average of three-feet of frigid, rushing water. 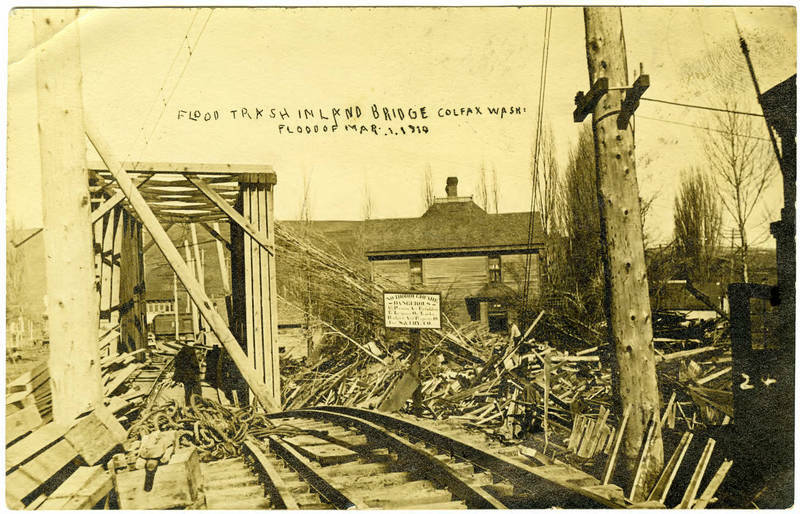 On March 4, as the waters began to recede, Colfax and Moscow were left "completely cut-off from the outside world" and were without trains, or even a telegraph wire. 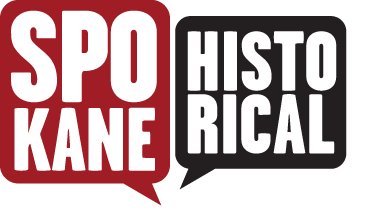 In fact, the Spokane & Inland Empire train depot was washed from its foundation, slamming into another building over 200 yards away. Colfax suffered an estimated loss of around $300,000.00. 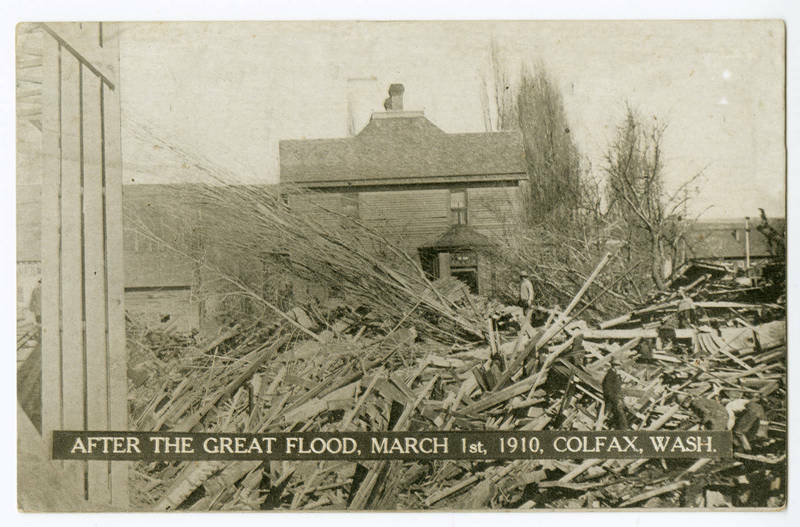 The extreme damage created by the flood forced a Colfax Gazette reporter to ask, "Is this the winter of our discontent?" Fortunately, there were no deaths caused by the floods and the afflicted communities immediately rebuilt. If anything, Colfax was only strengthened as a community as a result of the rebuilding efforts and the stories of individual bravery which demonstrated the power of humanity in times of struggle. Unfortunately, this was not the last flood that Palouse-area residents would experience. Similarly devastating floods occurred again in 1933 and 1948, which eventually led to the Colfax Flood Control Project in 1962. 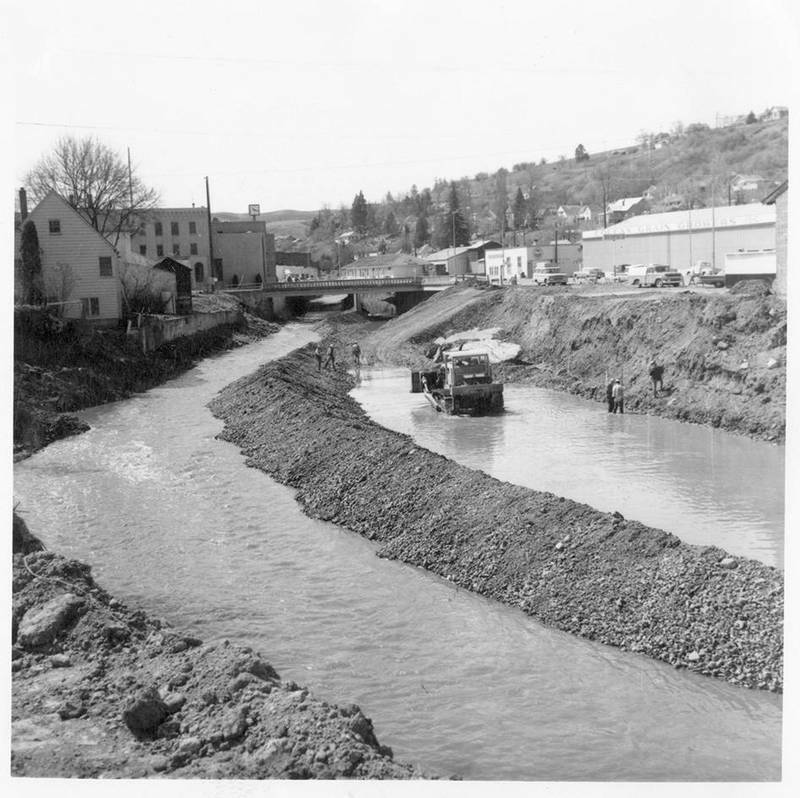 The project's construction involved the deepening of the Palouse River channel, building concrete-lined canals and retaining walls at a cost of $ 203,000.00. Since the project was completed in 1964, the town has managed to stay dry and subsequently, has experienced no problems with the Palouse River since. 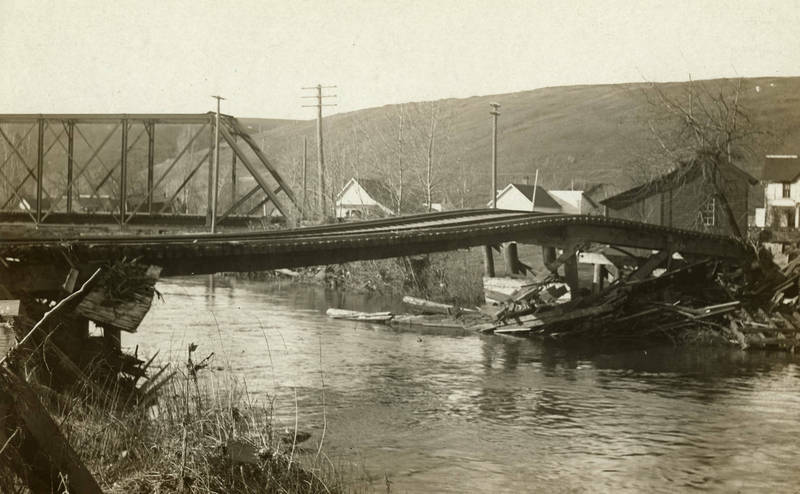 Colfax Railroad Bridge, 1910: Many of Colfax's bridges were destroyed during the flood, due mostly to the debris rushed down the flooding river. Because of this, Colfax residents were stranded and the only means to get in and out of town was walking. Telegraph lines were down as well and would not be repaired for days following the flood. Image courtesy of Whitman County Rural Heritage. 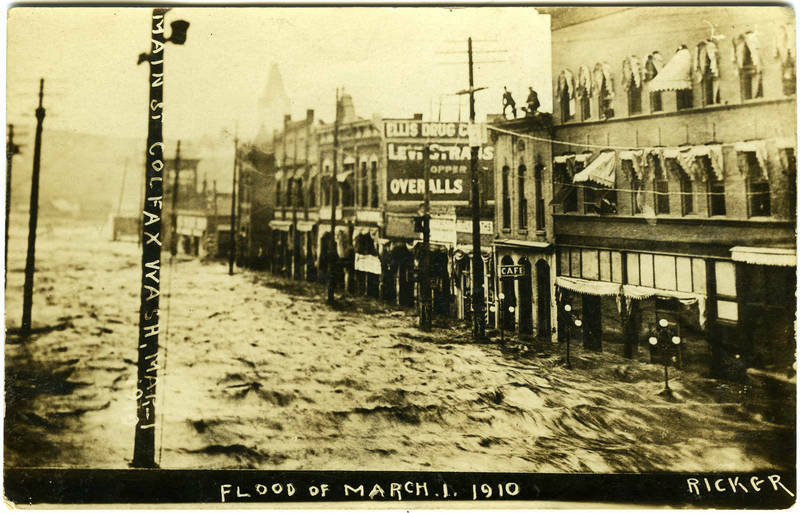 Robert M. Lambeth, “1910: The Palouse River Floods Colfax,” Spokane Historical, accessed April 20, 2019, https://spokanehistorical.org/items/show/429. "Hundreds Homeless at Colfax." Spokane Daily Chronicle, March 3, 1910. "Colfax out of Danger." Spokane Daily Chronicle, March 4, 1910. "Colfax is Threatened." Spokane Daily Chronicle, February 28, 1910. 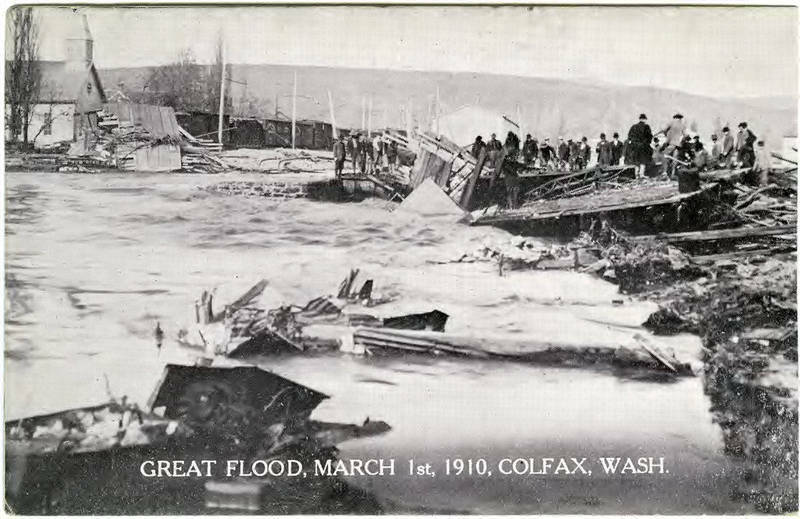 "Colfax Devastated by Flood." Colfax Gazette, March 4, 1910. "Colfax Faces Problems in Flood Control Project." Spokesman-Review, January 5, 1961.